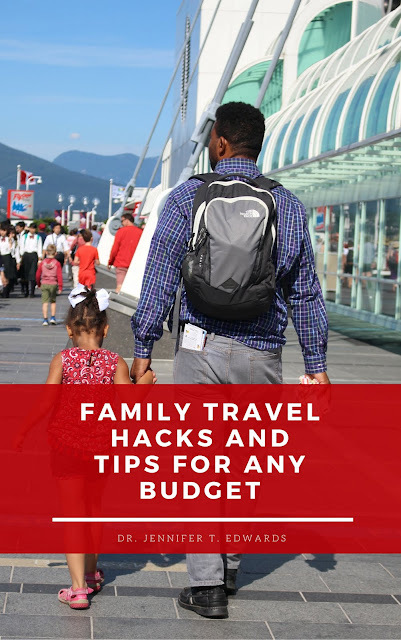 Family Travel Hacks and Tips for Any Budget is focused on creating family memories through travel experiences. Did I mention that the book is ONLY $.99! Quite a deal! Here's the link - http://amzn.to/2DCfhAp. Chapter one, “Why Travel with Kids” focuses on the importance of traveling with children. This chapter includes multiple resources, book suggestions, and sample questions that you can ask your children before your family trip. Chapter two, “Traveling with Kids on a Budget”, presents tips for frugal family travelers and luxury family travelers. This chapter features recipes, meal suggestions, packing lists, and additional resources. Chapter three, “Flying, Cruising, and Riding the Rails with Children” features several tips and checklists for each type of travel. These tips and checklists are timeline-based and highlight items to consider when booking your trip, 24 hours before your trip, and when you arrive to the airport/terminal/depot. Chapter four, “Hotels with Kids”, focused on items to consider when booking your hotel, when you arrive to your hotel, and when checking out of your hotel. Chapter five, “Day Trips to Local Attractions”, includes the “Top 10 Things to Pack for a Sea World Adventure (or Other Theme Park)”, a sample day trip itinerary for families, and suggestions for family reflections after a day trip. Chapter six, “Innovative Ways to Pack for Family Travel Experiences”, highlights innovative ways to integrate binder clips and zipper bags on your trip. These everyday items can be lifesavers for families on-the-go!